Alya aktiv is a small high-end 2 way floorstanding speaker. The kit is delivered with tweeter Audaphon TWS 30/4. This tweeter is also perfect for applications with deep crossover frequency. Two Wavecor woofers WF120CU07 with phase-plug and very linear frequency response is used for the bass range. Alya passiv has been developed by Daniel Gattig and Dennis Frank. The active version has been developed by the team of journal Klang+Ton. The possibility to adapt the amplifier to the loudspeaker or subwoofer. In addition the possibility to tune the DSP according to room conditions. We would like to help you tuning the signal processors for your room. Or we delivered them tuned for your room. Additional information on digital signal processors (DSP): what is a DSP?, Tuning according to room conditions and Examples Of DSP use (e.g. in subwoofers). The frequency response of this speaker a very linear. The decay spectrum is nearly perfect. At low volume, i.e. 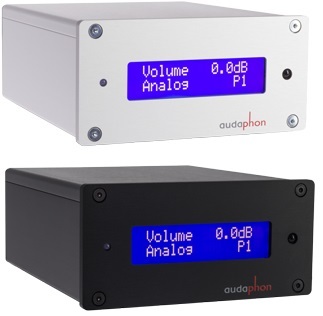 85 dB at 1 m, the nonlinear distortions are not higher than 0.3% between 300 Hz and 14000 Hz and doesn't exceed 0.6% at 95 dB at 1 m.
If you have a 4 channel power amplifier, you can use the Alya kit with the digital signal processor without amplifier Audaphon DSP-24 (instead of AMP-24).